Needle insertion in soft tissues is a common step in many minimally invasive medical procedures. Clinical needle-based interventions are used in therapeutic and diagnostic procedures, including biopsy, brachytherapy, and neurosurgery. Clinical imaging techniques such as ultrasound and magnetic resonance images, and computed tomography scans are commonly used during the needle insertion. Ultrasound is considered a safe and easily accessible imaging modality to visualize both the needle and target (lesion) during the procedure. A three-dimensional needle tracking using a two-dimensional ultrasound probe was presented in our previous works. 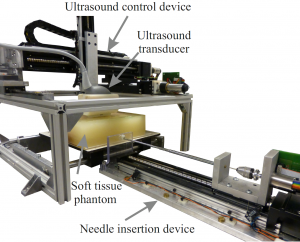 This needle tracking system allowed us to perform closed loop flexible needle steering in gelatin phantoms and biological tissues with targeting errors smaller than 2mm. However, the results presented so far have shown that tracking system should be improved in order to increase its robustness in different types of soft tissues. Project: The aim of this project is to improve the needle tracking system that is currently in use. The tracking system uses a 2D ultrasound probe positioned perpendicular to the needle tip. 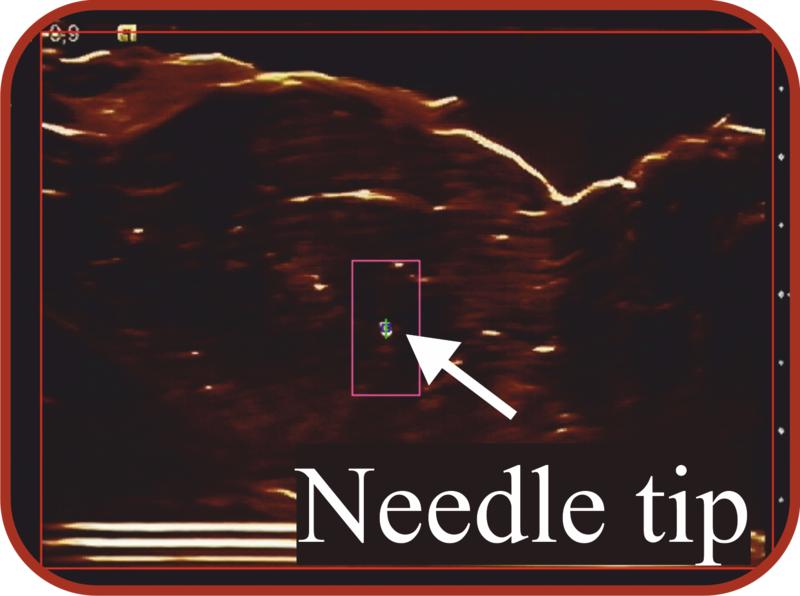 The probe is moved following the needle tip motion to have it always visible in the ultrasound image. 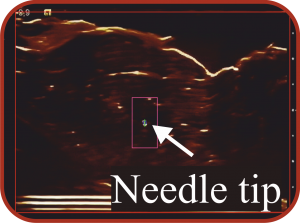 However, when the needle is inserted through a soft tissue, the tip position might be mistaken due to the tissue structures that looks similar to the needle tip in the ultrasound image. The main goal of this project is to improve the image processing in order to be able to track the needle in different types of soft tissues.